Steph and Seth Curry chat about how their family bond prepared them for success in basketball as part of our NBA D-League Family Footsteps Presented by American Express. The NBA Development League, the NBA's official minor league, is now on YouTube, showing over 350 live games on the NBA D-League YouTube Channel and NBADLeague.com. Fans can get a glimpse at the players, coaches and officials competing to ascend to the NBA's ranks. More than 40% of players drafted into the NBA since 2005 have played in the NBA D-League. Ten former NBA players are in the NBA D-League coaching ranks this season. 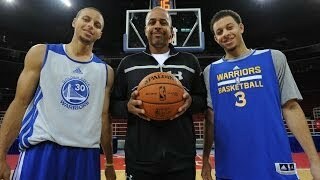 The Curry Brothers: NBA D-League Family Footsteps Presented by American Express. ... American, Brothers, Curry, DLeague, Express, FAMILY, Footsteps, Presented . ... The Curry Family In New Orleans - 2014 Nba All-star Sunday: ... Stephen Curry & Family. ... NBA D-League Family Footsteps Presented by American Express.